Longtime readers of this site will be familiar with the name Business Integrity, developer of ContractExpress (formerly DealBuilder) document-assembly software. Fixing contract drafting involves fixing not only language but also process, and fixing the process means using document assembly. So I’ve long had a keen interest in document assembly. About three years ago I became acquainted with Business Integrity, and when I decided that it made sense for me to cast my lot with one document-assembly vendor, I chose BI. It was an easy enough decision: their software is, I believe, the market leader, and in my conversations with Tim Allen, BI’s VP for North America, it became clear that we shared similar views on where document assembly was heading. And it didn’t hurt that Tim and his colleagues are a congenial bunch to hang out with at a trade-show booth. Last year Business Integrity sponsored my West LegalEdcenter seminars and webcasts and my Osgoode Professional Development seminars, and they’ve just renewed their sponsorship. But they’re more a partner than a sponsor. And my relationship with them entails zero compromise on my part in terms of what I say or write about. But on to the business at hand. At LegalTech New York last week, Business Integrity launched ContractExpress.com. BI’s chief technology office, Andy Wishart, was kind enough to take the time to talk with me about it. Andy: ContractExpress.com is the world’s first premium document-assembly solution to be offered on a cloud platform, in other words on a “software as a service” basis. We built it on our proven DealBuilder technology, which is used by many of the world’s leading law firms and corporate legal departments. Ken: Hasn’t document assembly been around for years? Andy: Document-assembly applications, including our own “on premises” solution (with our software installed on an organization’s server), have been around for a long time, and they allow the organizations to design and deploy automated documents much more quickly and easily. But most lawyers have been slow to adopt document assembly, despite the game-changing nature of the technology. We attribute that to two factors. First, there’s the cost of installing the software. And second, creating useful document templates can be challenging—most lawyers aren’t interested in becoming XML programmers. ContractExpress.com solves both problems by offering a simple-to-use, cloud-based solution. Ken: What do you mean by “cloud-based”? Andy: “Cloud-based” solutions—they’re also identified by the slogan “software as a service,” or “SaaS,” reside on the Internet. (Hence the metaphor “the cloud.”) Little or no software needs to be installed and little or no infrastructure is required. Any organization using ContractExpress.com would get the full benefit and functionality of our on-premises solution, but with no set-up costs, no need for new infrastructure, none of the cost and hassle of IT support, and no other capital expenditures. The only cost is a subscription fee of $195 per user per month—otherwise, the user is set. We’re also offering a truly free 60-day trial. In the case of installed software, trials are typically impractical, as the set-up time and infrastructure involved make it so difficult to “undo” the application that it’s not worth even starting. But because ContractExpress.com resides on the Internet, the ramp-up time is negligible. Users can really take advantage of the trial period. Ken: Users need no infrastructure at all? Andy: Well, they need a browser and an Internet connection, of course. And Word 2007 is required to install ContractExpress Author, which enables users to create templates for ContractExpress.com. Ken: Putting information in the cloud raises the question of security. How secure is information that users load on ContractExpress.com? Andy: Users can rest assured that their information will be safe, as ContractExpress.com meets the most stringent security standards at data center, physical, system, operational, and application levels. Anyone who is interested in seeing more detailed information should ask us for our security summary. Ken: So we’ve covered the issue of cost. What about the ease of use? Andy: As with the installed version of our software, the process is questionnaire-based. Instead of editing a template or precedent contract, the user answers an intelligent questionnaire that captures the terms of the transaction. Questions are only asked if required, and are only asked once. With one click, the user can implement hundreds of instances of optional text throughout a document, instead of having to consider and manually input each of those changes in a Word document. But using document-assembly tools to create documents has always been pretty easy. The real difficulty has been in designing the templates used to generate the documents, as that part of the process requires that lawyers invest time up-front in order to reap the downstream efficiencies. Where ContractExpress.com really excels is that it removes much of the complexity inherent in traditional document-assembly tools. Whereas other document-assembly systems require that users create templates in a complex proprietary or XML-based computer language, our template design tool provides for intuitive, plain-language mark-ups in Word. Ken: Excuse me while I play the straight man here: From the law-firm perspective, what’s the value proposition? 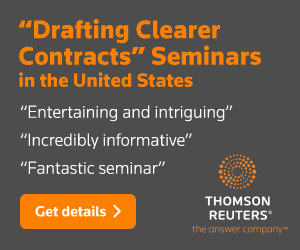 Is it really in a law firm’s best interest to spend less time drafting contracts? 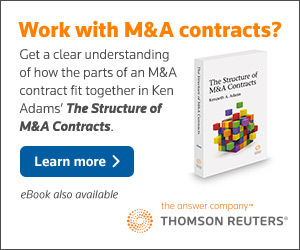 Andy: That may have been an uncertain proposition a few years ago, but clients are now requiring law firms to be more efficient and offer more value, and they’ve also become more sophisticated about applying sourcing principles when purchasing legal services. As a result, law firms can no longer be complacent about being able to reap rewards from inefficiency. It seems clear that increasingly, the firms that will thrive in this environment are those that use tools like ContractExpress.com to become more efficient. But in addition to allowing law firms to be more efficient, ContractExpress.com can help them be more profitable. Law departments are increasingly looking to have outside counsel work on a flat-fee basis. In a flat-fee world, using ContractExpress.com can improve your margins tremendously and allow you to achieve greater profits than you ever could from hourly billing. Our slogan is, “It’s how your clients want you to practice.” But it’s likely ContractExpress.com is also how your law firm’s CFO wants you to practice. Now it’s my turn to ask a question. You’re a keen observer of the document-assembly market. What impact do you see ContractExpress.com as having? 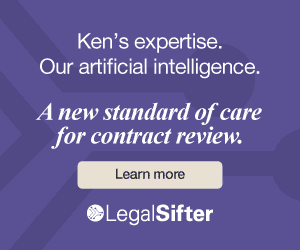 Ken: It’s clear that ContractExpress.com makes it much easier for law firms and law departments to get access to the efficiencies that ContractExpress offers. But in addition to the obstacles you’ve discussed—obstacles that ContractExpress.com largely demolishes—you also face industrial-strength inertia, with a side order of delusion. So change in contract drafting is happening a lot more slowly than any of us would like. But it is happening, and your launch of ContractExpress.com represents a significant step forward. In closing, how can readers of this blog find out more about ConractExpress.com? Andy: I’ve always believed the best way to learn is by doing. Readers can get a free, no-risk 60-day trial at www.ContractExpress.com.